A gang of bank robbers hide their loot in the car of a family going camping. They chase down the family to kill them and get the loot back, but run into a fight. Walter Hagen: Tell me Bobby why do you play this game? Robert Tyre Jones, Jr.: I play because I love it. Walter Hagen: Well I play for the money. I have to win. That is why every time we face each other I will always beat you. We saw this movie last night on its opening night for the public. 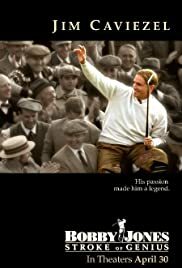 It was a good movie about a man who loved to play golf, and over his lifetime transformed himself into a man of integrity, perseverance, and great intelligence. He knew what was really important in his life and he made a plan that allowed him to fulfill his destiny in golf and in his personal life. He was the best golf player in the world, but he was also an awesome man personally. One of his greatest accomplishments was bringing his father and grandfather together, healing a life-long rift. The movie was well done. It was both entertaining and enlightening. It definitely kept our interest for the whole two hours. We felt his sense of life-long struggle, that life was never easy for him, and we celebrated his accomplishments, both on and off the golf course. The actors did a wonderful job, especially Jim Caviezel as Bobby and Malcolm McDowell as OB Keilor, the newspaper reporter who wrote about Bobby's career from the very beginning. Jeremy Northam also had a good supporting role as Walter Hagen. We'd recommend that you see this movie; you don't have to love golf to enjoy it (but if you do, you'll enjoy it all the more). It's worth seeing in the movie theater.